Price shown reflects the required Fisher & Paykel Minimum Advertised Pricing. The SleepStyle™ 608 CPAP with ThermoSmart™ Humidifier is the first CPAP in the world to constantly deliver controlled humidity. ThermoSmart™ technology is a unique heated breathing tube that delivers higher customized humidity levels that are maintained throughout the night. These humidity levels maintain normal airway conditions without the side effect of condensation or humidity rainout*. The SleepStyle™ 608 CPAP with ThermoSmart™ Humidifier includes the usage recording capability features of the SleepStyle™ 604 but also adds Automatic Altitude Adjustment and Leak Compensation. These innovative performance features promote better results in clinical effectiveness and patient care. The ComplianceMaximizer™ software for CPAP and humidifier usage and performance data reporting for clinicians and providers. This software meets the insurance and Medicare compliance data reporting requirements. 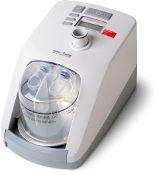 The SleepStyle™ 608 CPAP with ThermoSmart™ Humidifier includes the patient manual, 1 dishwasher safe chamber, connector, 6ft tubing, air filter, water funnel and carry bag. * Subject to the operating conditions specified in the applicable Operating Manual.